"S2-NB-2-HEX" Four 4 barrel /wires (4) 2-14AWG wire range, Grounding or Power Distribution or Power Collection Lug. UL Listed for General Use including grounding in dry locations. 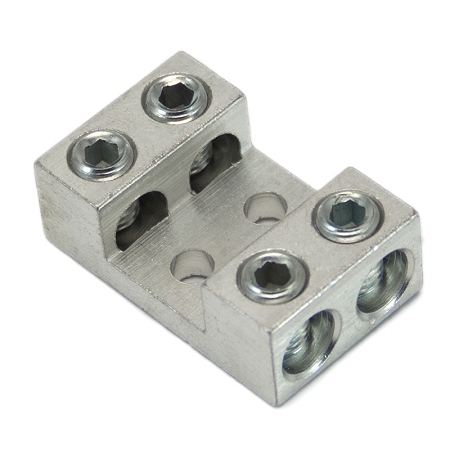 Up to Four wires (4 conductors) aluminum or copper wire, CU9AL, 90C temperature rating, two (2) #10 Bolt mounting holes , UL Listed, CSA Certified. IHI brand. Made in the USA. Power and grounding use ul listed lug, wire rated current capacity.